Scientists, historians and analysts agree that most likely XXI will be the century of Biology. The augment of the technological capacity to obtain and manage large volumes of data from biological systems should lead biology and, in particular ecology, towards a new theoretical sphere, increasingly grounded on principles and general mechanisms. In this transition, physics will play an essential role for its capacity for abstract and fundamental reasoning. At the frontier between biology and physics, this revolution is already under way. The significant increase in the availability of data has already put forward relevant quantitative advances on several biological disciplines, among them ecology, ranging from the study of ecosystem functioning to population and behavioral ecology. However, and due to the complexity of the issues that arise, this revolution requires a great deal of synthesis and conceptualization. This meeting aims to be a meeting point for researchers living in this stimulating frontier, so that they offer us their points of view and the keys that must mark these challenges for the future. Mercedes Pascual, Andreas Huth, Jens Krause, Gonzalo de Polavieja. The cost of the registration is 140€ for senior researchers and 70€ for students. 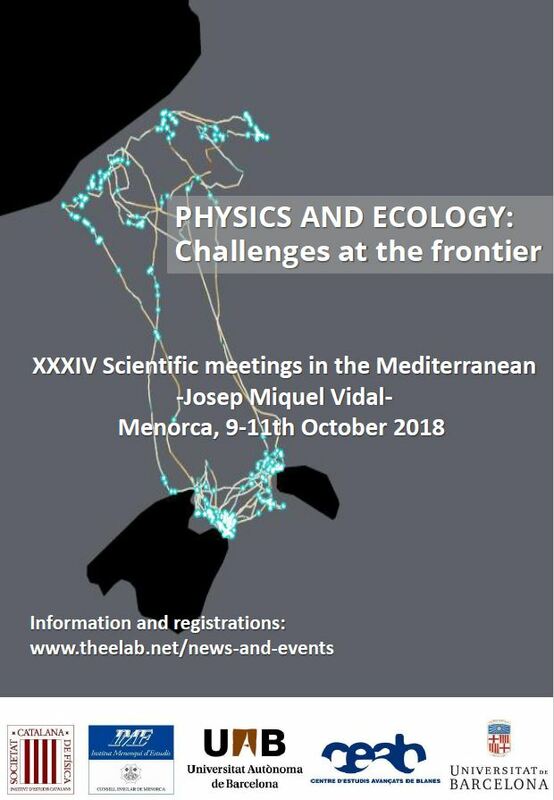 Complete the form: https://www.iec.cat/jornades/trobadescientifiques2018.asp Deadline: September 30th 2018. Contributions: send an email in Word format or Latex (download templates) to: daniel.campos@uab.es, indicating type of contribution (oral, poster) , and name and affiliation of the authors. Deadline extended: September 1st 2018 (oral contributions) and September 15th (posters). Camí des Castell, 28, 07702 Maó (Menorca, Illes Balears). David Alonso, Frederic Bartumeus, Daniel Campos, Vicenç Mendez, Maria Del Carmen Miguel, Daniel Oro. For further information, contact Daniel Campos <daniel.campos@uab.cat>.